The aim of Clay College is to teach a new generation of studio potters the skills they need to establish themselves as professional makers. 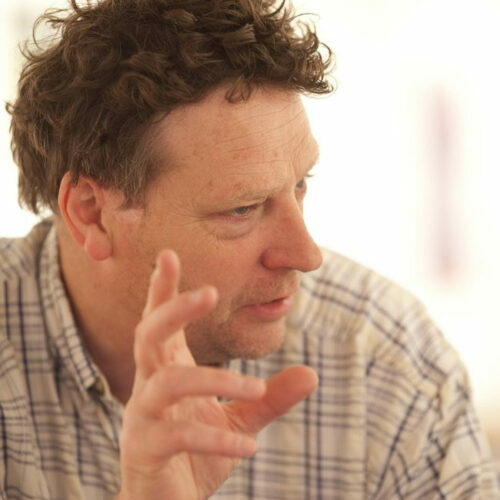 The full-time two year Diploma course is led by Course Director, Kevin Millward, an experienced professional and independent potter with extensive teaching experience. His expert and supportive one-to-one tuition is augmented by masterclasses in specialist areas, taught by visiting master potters. Students are taught all aspects of design, throwing, glazing, kiln building and firing, alongside traditional hand building and decoration techniques. The focus of the course is teaching practical skills but we also include research, history, marketing, sales and business skills. The course facilitates the exploration of a variety of styles, including genres, materials, surface treatment, and firing types. Students are encouraged to develop their own style, drawing on practical and technical knowledge from experts in their field. This is augmented by modules focusing on business and marketing which offer students the opportunity to become self-sufficient, developing their own business model to suit their work. There are assessments at the end of each project and at the end of the year. The final year assessment is combined with preparation for and presentation of work for an exhibition in the Clay College Gallery. 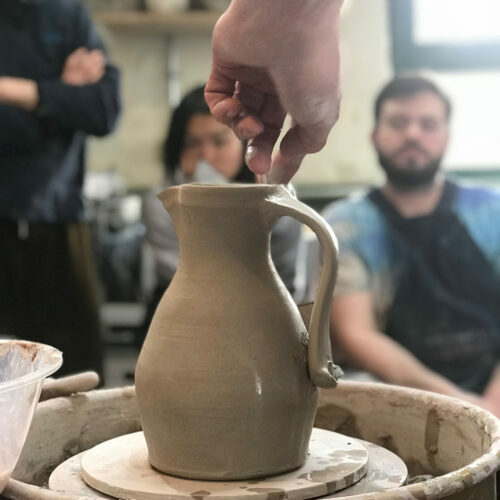 Our Diploma course is designed to create self-sufficient potters and our graduates will be uniquely qualified to start their careers with sound practical, material, design and business knowledge. On completion of the course, students will have had the opportunity to learn the technical skills, creativity and practical wisdom necessary to establish a successful ceramic studio or to join a production pottery. How is this different from other courses on offer? The course is intensive, condensing a three year curriculum into two years, with each year consisting of 45 weeks over three terms. Students have a minimum of 20 hours contact time with tutors each week. The core curriculum and specialist masterclasses are taught by potters who make their living from their craft. The focus is on core skills and the use of materials. Students are taught business, sales and marketing skills. We embrace an holistic approach teaching all the skills, knowledge and techniques necessary for students to set up as practicing potters. Students gain weekly production pottery experience. Our location is unique, a working pottery in the heart of the Potteries, surrounded by studios, commercial potteries, museums and galleries. Hands-on experience of designing and making new work to commission. We are widely supported by the international pottery community, creating opportunities for work placements, collaborations and participation at fairs and events. We have close ties with the international pottery community. 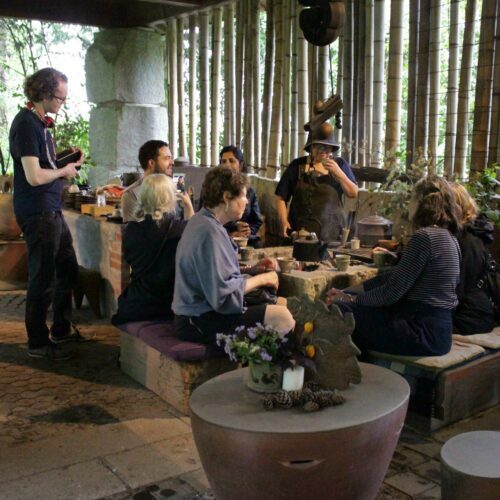 This year the students visited the Mashiko Pottery International Association to study alongside potters in Japan. We have our own gallery. The Clay College Gallery hosts selling exhibitions of internationally renowned potters, themed to match the curriculum so that students can see, handle and sell the pots they aspire to make. The students also show and sell their own work, learning to display and present their work to a wide range of visitors and collectors. Tuition is delivered by the Course Director with a rolling program of tutorials and demonstrations given by internationally renowned potters and artists. 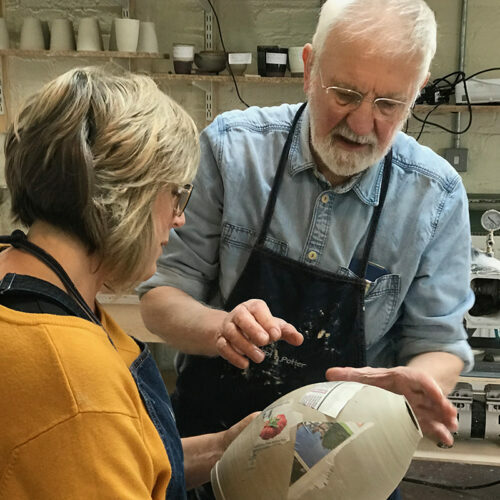 The inclusion of visiting lecturers and workshops allows students access to generations of expertise and knowledge covering all aspects of ceramics. Students visit museums and collections of ceramics to develop their knowledge and creativity, and clay and glaze manufacturers to understand how the materials they use are processed. These outings to established makers, small studios and modern large-scale industrial manufactures will allow students to experience many different approaches to working with clay. To ensure students have successful careers ahead of them it is important that they gain experience of marketing and selling themselves, as makers, and their work. The introduction of business skills and methods of promotion is covered by visiting lecturers well versed in running their own businesses and in selling and marketing. The Clay College Gallery hosts selling exhibitions throughout the year, enabling students to see, handle and sell work by master potters. 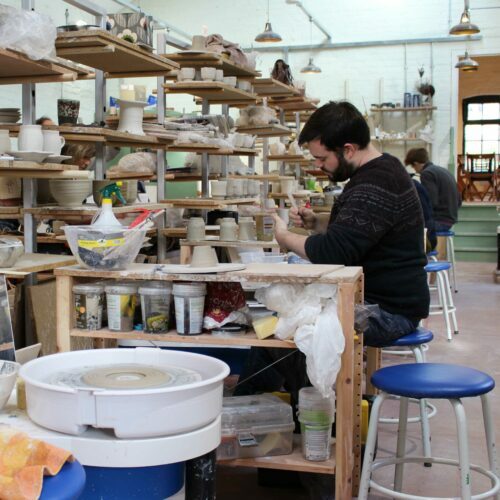 Clay College provides a creative environment to nurture an individual’s development and growth, teaching the combination of knowledge and proficiency in process and technical skills, and the creativity and awareness needed to make great ceramics. The syllabus focuses on the teaching of core skills. The course runs across a 45 week year, consisting of three 15-week terms. Weekdays run from 9am to 5pm. Students can expect at least 20 hours contact time with tutors per week. We teach a broad range of throwing skills including cylinders, bowls, teapots, collaring in, lids and galleries and throwing large. Associated skills include handles, lips, spouts and making composite forms. Handbuilding classes cover various making techniques including slab building, coiling, modelling and mould making and slip casting. Each making project includes research and design components and is used to teach surface treatment techniques, including slip decoration, stamps and sprigs, faceting, carving, brushwork and underglaze decoration. Practical lessons are integrated with a program of supporting sessions, such as clay, glaze and kiln technology, that provide students with a real breadth of knowledge and experience to reinforce their creative learning. Students learn about the design and building of all types of kilns, and participate in building a kiln in the 1st year. 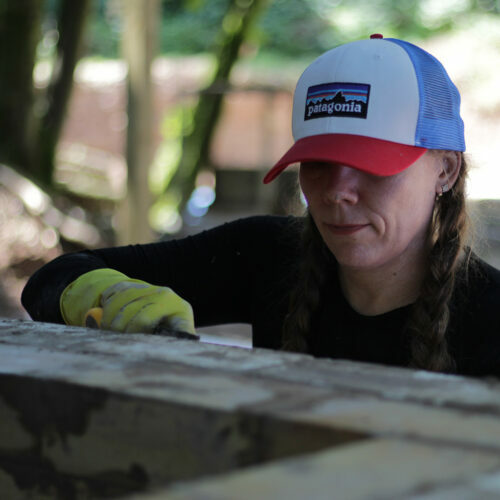 They learn kiln maintenance and experience packing and firing their own work in a variety of kilns, including electric, gas, soda and wood kilns. In glaze technology, students learn about glaze theory and get practical experience testing and developing their own glazes. The course covers a range of temperatures and techniques, including earthenware, stoneware, oxidation, reduction and vapour/wood firing. Clay theory is covered, together with clay body development and slip development. Students reclaim their own clays, test manufactured clays and spend practical time developing their own clay body for a specific project. Students are be expected to use and maintain sketchbooks to develop their ideas and illustrate their progress and as a record of their research work. They are expected to immerse themselves in the history of ceramics and design in all areas of practice, from traditional to contemporary, studio to industrial. An international view of ceramics is presented in lectures and through visits to galleries and museums. The second year teaches skills necessary for marketing work and the setting up and running of a small business. Students have the opportunity to present and sell their work in the college gallery space as well as visiting pottery shows, trade and craft fairs. In the second year there is an international trip to work and learn alongside another pottery community. 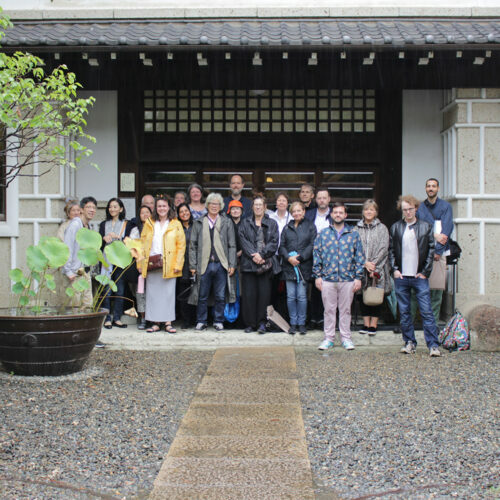 The first cohort of students visited Japan in September 2018. This included time spent in Mashiko visiting potters, museums, experiencing local food and culture along with time working in the studio. Many potters augment their income by teaching and students have the opportunity to gain experience of teaching the public evening classes held at the college. The structure of the course follows a sequence of projects, which combine practical skills with theory, creating an integrated approach to learning. There are assessments at the end of the projects and at the end of the year. The final year assessment is combined with the preparation and presentation of work for an exhibition in the gallery space at the college. Students who complete the course successfully are awarded a Diploma by Clay College. As a unique course, the Diploma is currently unaccredited but the award will signify that the individual student is able to work to the high standards that Clay College has set. Course fees for students from EU countries will be £9000* per year, due in full prior to the start of each academic year. It is our belief that the cost of a course at Clay College Stoke should not prevent a talented potter from receiving the best education and we fund-raise throughout the year to provide significant bursaries to a number of students. Bursaries are intended to support eligible students with financial needs and to promote excellence. Opportunities to apply for a bursary are available through the application process and applicants will be required to provide proof of hardship. What if I am applying from a country outside the EU? Applications from overseas are very welcome but will need to provide proof of eligibility to study in the UK as part of the application process. Fees for non-EU students are £13,000* per year, due in full prior to the start of each academic year. To ensure the maintenance of a creative and positive learning environment and the successful delivery of the course, students are expected to maintain excellent attendance, timekeeping and organisational skills. A respect for other people and the working environment is essential. Students are also expected to observe and adhere to the required policies of the college. The College is unable to provide accommodation for students and students will be responsible for organising their own accommodation. However, Stoke offers a wide range of affordable housing, within a short distance of the studio. 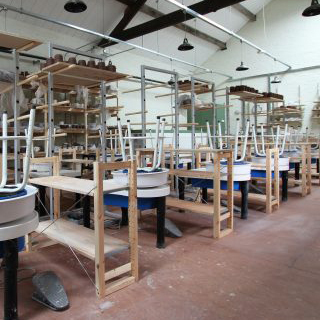 Clay College is located at Middleport Pottery in Stoke on Trent, the heart of the Potteries. 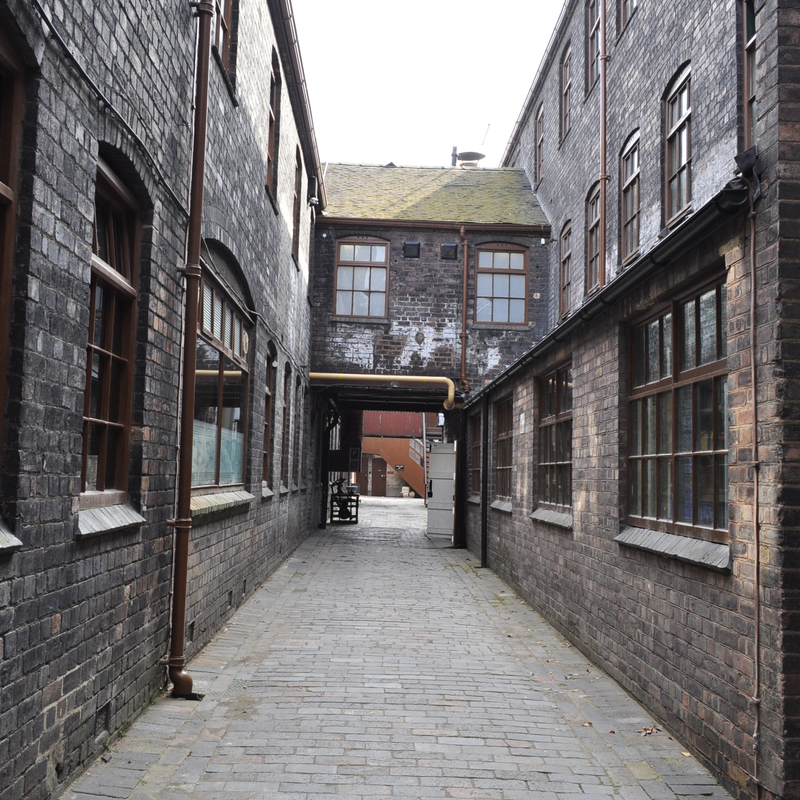 The college is in a stand-alone building within Middleport Pottery; The Prince of Wales Studio. The building has been beautifully restored by the Prince’s Regeneration Trust and is now owned and managed by the UK Historic Building Preservation Trust (UKHBPT). There is a gallery space, a kitchen area, a breakout space and a library with an amazing collection of books on all aspects of ceramics. The college has on site 2 electric kilns, a number of gas kilns and a soda kiln which the students built in the summer. Being part of the Middleport pottery site, means that the students are able to immerse themselves in a thriving and diverse ceramics community with both commercial and artisan potteries on the doorstep. Which Mailing list/s would you like to join?